Designed to sparkle at every opportunity, this dazzling diamond pave set ring simply exudes glamour. Crafted in chic 9ct white gold for a fresh and contemporary feel. Indulge your sense of style. 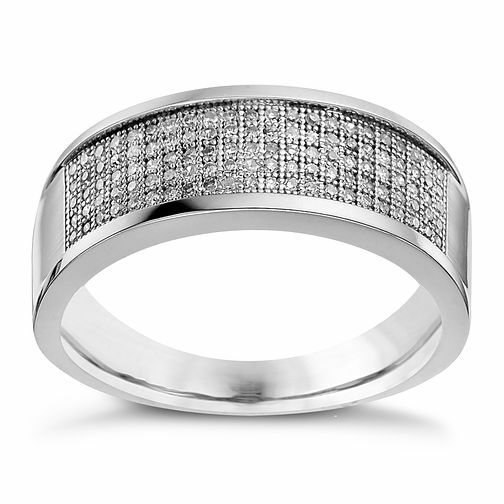 Men's 9ct White Gold 0.30ct Diamond Pave Set 8mm Ring is rated 4.0 out of 5 by 1. Rated 4 out of 5 by Anonymous from Beautiful ring Received so many compliments! Its very nice on the hand, good size, good wuality, fab design. Couldnt recommend more !